MACOMB, IL -- Western Illinois University will host a film screening to honor veterans and celebrate the 10-year anniversary of the interdisciplinary film minor at 6:45 p.m. Tuesday, Nov. 7 in the University Union's Sandburg Theatre as part of Military Appreciation Week. The film, "In My Brother's Shoes," commemorates the life and sacrifice of a fallen Marine whose brother puts on his combat boots to take a pilgrimage to Rome to process his grief. The film has been screened at American colleges, educational institutes and military associations, and presented at several international film festivals such as Cannes and won the Best Short Film Award at the International Catholic Film Festival in the Vatican. Before becoming a director, Lucia Mauro was a theater critic and an arts and culture writer. She collaborated with the Chicago Tribune, Chicago Magazine, Chicago Public Radio and In Theatre magazine. "In My Brother's Shoes," released in 2014, marks her directorial debut. Mauro's second film, "One Year Later," centered on a cancer survivor who takes a trip to the Italian Alps to rediscover herself. Her third film, currently in post-production, is "Frances Xavier Cabrini: The People's Saint," in honor of the first American citizen saint's 100th anniversary. Born in Italy, Enzo De Rosa is an internationally known musician, pianist and composer. He has worked on more than 600 productions for film, Italian television and radio, international television, theater and opera. He has studied with musicians such as Tita Parisi in Naples, A Ciccolini at the Accademia Nazionale di Biella, J. Swann and B. Petrushansky at the Accademia Pianistica of Imola. He studied composition and film music with L. Bacalov and F. Mannino. He taught at the Conservatory of Music in Benevento, Italy, until 2013. He lives and works in Montreal, Canada. Before the Nov. 7 screening at Western, De Rosa will perform live a concert of music from Italian films. At the end of the program, there will be a question and answer session with Mauro and De Rosa. 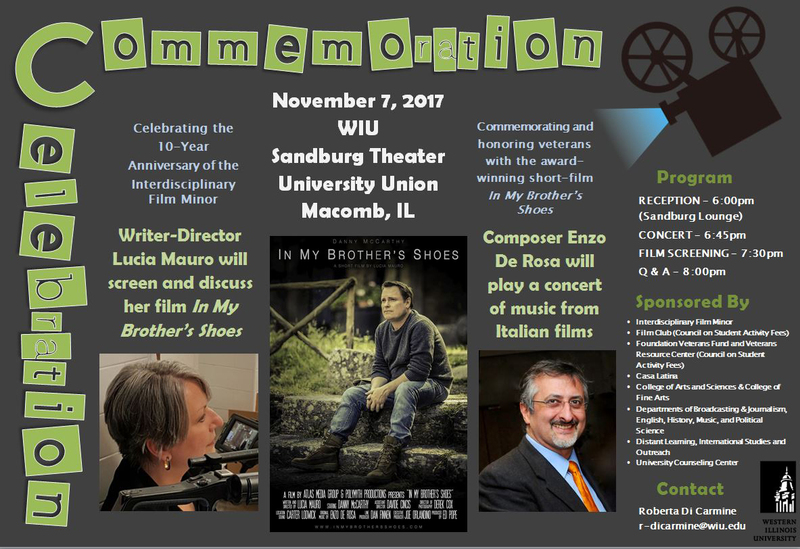 WIU Professor of Film and Faculty Advisor of the interdisciplinary film minor Roberta Di Carmine and WIU Department of English Chair Mark will introduce the event. The program begins at 6 p.m. with a reception in the Sandburg Lounge, followed by the screening. This event is sponsored by the Interdisciplinary Film Minor, WIU Film Club (Council on Student Activity Fees), Casa Latina, the WIU departments of Broadcasting and Journalism, English, History, Music and Political Science, the Foundation Veterans Fund and the WIU Veterans Resource Center (Council on Student Activity Fees), Distant Learning, International Studies and Outreach, the University Counseling Center, and the WIU colleges of Arts and Science and Fine Arts and Communication. For more information, contact Di Carmine at R-Dicarmine@wiu.edu, or at (309) 298-2192.